In the second half of the 20th century several world economies have benefited considerably by capitalizing on their links with national Diasporas. China and Israel seem to be the best-known examples of countries that received a major developmental push from their nationals located throughout the world. While in most countries the main Diaspora-related benefit for the domestic economy was and still is associated with private transfers (including remittances), sent by members of Diasporas to their relatives and friends at home, China and Israel managed to complement this traditional financial support by much more active involvement of the Diaspora in their economic development. In these countries, Diaspora investors and entrepreneurs played a critical role in attracting FDI, setting up joint ventures, promoting export of domestic companies, etc. In short, these examples confirm that traditional ethnical and cultural links could be instrumental in facilitating integration into the international economy as well as transferring of new professional and managerial skills. Efficient utilization of the Diaspora’s potential is rather relevant for economies in transition. This is because, on the supply side, many countries of Eastern and Central Europe do have large (relative to the size of their population), well-organized, highly educated and broadly successful Diasporas. Armenia, Lithuania, and Serbia may be mentioned as the most obvious examples. But, this is also relevant for Poland, other Baltic countries and former Yugoslavian republics. One may also expect that the Cuban Diaspora (Cuban exiles) have the potential to play a prominent role in the future market transition in Cuba. Even more importantly, on the demand side, as the experience of the first decade of transition has shown, most economies in transition face a significant shortage of skills and resources, over which many Diasporan communities have much better control and/or access. This relates to many core components of financial, human, and social capital, which, if well mobilized, could accelerate the entire dynamics of the transition process. This paper develops additional economic arguments to emphasize the potential importance of the Diasporas’ contribution to economic transformation of former socialist economies. At the same time, it argues that so far this potential has been grossly underutilized, especially in the economies of the Former Soviet Union (FSU). Based on the analysis of such underutilization, the paper provides a set of simple recommendations on how to rationalize the Diaspora’s involvement and assistance to home countries in the course of transition. The paper is organized as follows. The first section suggests a general framework to analyze the Diaspora’s role in economic transition. The second section provides an in-depth review of the Armenian experience with mobilizing the Diaspora’s assistance in the 1990s. It argues that from the transition perspective, support provided by the Armenian Diaspora to independent Armenia since 1991 has been rather inefficient. The third section summarizes differences between Armenian and Israeli settings and argues that these could explain a considerable part of observed differences in the efficiency of the Diasporas’ mobilization. The final section presents a set of recommendations that intend to balance political and humanitarian objectives of Diasporas with their contribution to economic development of home countries. These recommendations may be used for developing a strategy to be played by the Cuban exile community in the future Cuban transition. Albert Hirschman (1958) once noted that development is not so much about allocation of existing resources but rather about mobilizing resources that are hidden, scattered or badly utilized. The traditional practice of the relationship between Diasporas and their countries of origin strongly supports this idea. Financial contributions of many Diasporas around the world to respective domestic economies is well documented and very significant. Several South Asian nations received more than US$2 billion in remittances a year (Castles, 1999). According to the Inter-American Development Bank (IDB), in six Latin American countries, annual remittances exceeded 10% of GDP (Inter-American Development Bank, 2001). • Speed of change in management culture and business practices is a critical factor of growth. When compared to the original understanding of challenges in transition, the current thinking seems to pay much less attention than in the early 1990s to the speed of privatization and tightness of monetary policy. While these are indeed important pre-requisites of successful transition, it is understood now that it is other factors that make a real difference in the medium term between countries’ transition paths. Those are the factors related to the quality of investment climate, proximity to established markets, speed of transfer of new managerial skills, simplicity of access to existing access, including land, etc. From this perspective, economies in transition (and developing countries in general) that have large and economically influential Diasporas may have strong comparative advantages. In short, the Diaspora could accelerate closing the gap that inevitably exists between the post-socialist economy and the rest of the world as well as provide a strong backing for integration of the home country into the global market. While expansion of new companies in transition economies is often constrained by lack of market knowledge and the high costs of entering new markets, Diasporas accumulate considerable business, networking and marketing skills.4 In most cases there are also business and professional Diaspora associations that could be instrumental in developing and implementing specific project initiatives. • provide advice to governments of home countries with respect to improvement of investment climate and deregulation. Especially attractive is the idea of Diasporan investors being the “first movers,” i.e., investors who could come first to an emerging market of the home country, and by doing this could change market expectations and advance an inflow of more conventional FDI. The concept of “first movers” is important to understand the dynamics of early transition, in a situation that is characterized by great uncertainty and excessive economic risks. First movers or market leaders are critical to get the economy moving in such an unattractive situation. They provide behavioral models for the rest of the economic agents. They consolidate reform coalitions that push the Government to undertake further reforms, including those related to fare competition and reduced administrative barriers. When compared to the average economic agent, Diaspora businessmen and professionals face a lower risk of becoming the first movers. They benefit from a specific informational advantage: common cultural background and established social links between Diaspora and local entrepreneurs help them to reduce transaction costs of new entry and building new partnerships. And by being the first movers, Diaspora representatives have a chance of becoming leaders, mentors, partners and godfathers of the local private sector. Still, there is not much positive experience worldwide. Diaspora networks as a source of development expertise and business linkages are underutilized and existing activity is fragmented and idiosyncratic. For the purposes of this paper, we are concentrated on the transition scenario, which is characterized by reform complications, uneven speed of transformation in different sectors, strong anti-reform opposition, and significant economic losses at the initial stages of reforms. This is not an unavoidable scenario, but it is not uncommon either. It happened in most of the countries of the former Soviet Union (FSU) as well as in places, to mention a few, such as Romania and Albania. There is an obvious reason why I am not interested in reviewing a more successful transition path: if transition goes smoothly, there is not much for the Diaspora to contribute to. Private markets and the local public sector would be generally capable of addressing primary challenges of transition. In cases like Poland and Slovenia, which in the first years of transition featured an explosion of local entrepreneurship, supported at a later stage by significant inflows of traditional FDI, the Diaspora’s contribution could be only marginal. This paper deals with a much less favorable transition setting. Its main characteristic rests on the fact that old communist elites are replaced only partially, and the new political establishment contains a good chunk of communist bureaucrats, security service officers, and managers of large state-owned enterprises (SOEs). This first generation of post-communist elite in this scenario is much less democratic and liberal than the leaders of the Czech velvet revolution. This elite does push aggressively for economic liberalization and privatization, but does it in a way that allows the elite (especially enterprise managers) to “privatize” major benefits of reforms. This type of political leader is broadly suspicious about the Diaspora. While they welcome economic and political support from the Diaspora, they do not want to see an increased representation of Diasporan activists and investors in the home country. They see and treat the Diaspora primarily as a source of potential political and economic competition. At the same time, quick liberalization and elimination of traditional socialist subsidies brings a major shock to the domestic economy. Many traditional industries collapse, and average household incomes plummet. Pre-transitional savings evaporate. It all leads to a fiscal crisis. The regime goes bankrupt, while the elite flourish and the economy features a major concentration of economic wealth. The country is facing a challenge of reindustrialization and finding its new place at global markets, but it doesn’t have the necessarily skills and resources to deal with these challenges. The international community initiates an assistance program to address humanitarian concerns and helps to deal with at least some of the development challenges. What should we expect from the Diaspora in this kind of setting? One may argue that Armenia had quite a beneficial starting position for transition. Back in the early 1990s, it demonstrated many similarities with Israel of the 1950s. The territorial conflict in Karabakh has mobilized Armenians worldwide, greatly strengthened ethnical identity, and advanced national consolidation. At the same time, one may think, based on the Israeli experience, that future Armenian transition to the market would be rather successful. Soviet Armenia was the most educated and most industrialized republic of the FSU. It was considered a Silicon Valley of the Soviet Union, with a major concentration of high tech industries. Its expected successful transition would be also backed by quite a developed infrastructure and the traditionally strong labor morale of Armenians. 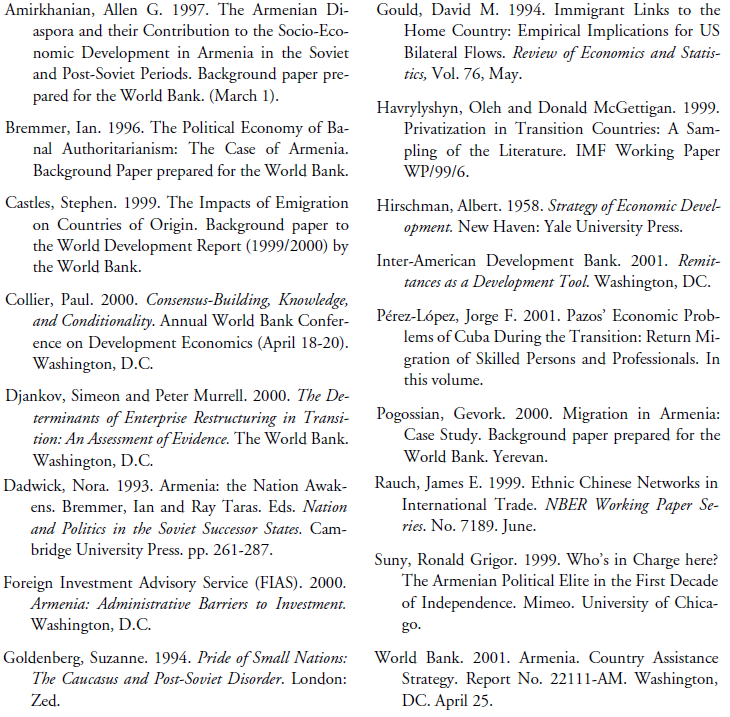 And of course, Armenia expected to be supported by the Diaspora. For such a small country (about 3.5 million inhabitants in 1990), the Diaspora presented an extraordinary source of development resources. It is believed that more than one million Armenians live in the United States, and at least another million in Europe, Middle East, and Latin America. This is a very successful national group, both economically and professionally. It is also well organized politically and socially, with an established track record of successful political and humanitarian mobilization. In addition, Armenians could rely on the good will of its traditional partner Russia—Russian Armenians (more than 1.5 million) have been traditionally quite influential in the Kremlin. While Armenia also had serious economic disadvantages, such as landlocked location, the impact of the 1988 Earthquake, and loss of traditional markets after disintegration of the FSU, on balance the country seemed to have a great development potential and a major chance of becoming a transition success story. The outcome of 10 years of Armenian transition has been quite disappointing. While the Armenian economy has been growing since 1994, its GDP in 2000 amounted to just two-thirds of the pre-transitional level. And the prevailing growth patterns are considered to be unsustainable: the economy shows too little of new private entry and job creation, low investments, and weak export capacity. Armenia currently belongs to a group of the poorest nations in the World, its nominal annual GDP per capita amounts to about $US650; 55% of the population lives in poverty; and about 30% of the labor force is unemployed (World Bank, 2001). It is also estimated that about 20% of the Armenian population has emigrated during these 10 years, with most of them moving to Russia (Poghossian, 2000). While there is no systematic analysis of this population outflow, piecemeal evidence suggests that at least 30% of all migrants have college degrees. This clearly constitutes a major brain drain, which deprives the country of its major long-term development resource. At the same time, in the short term this new emigration provides considerable income support for the Armenian population. It is estimated that recent emigrants contribute up to 65% of total private transfers received by Armenia. Weak export performance should be considered as a surprising outcome. Even though Armenia has one of the most liberalized trade regimes in the Commonwealth of Independent States (CIS), its merchandise exports amounted in 2000 to 16% of GDP, among the lowest in the FSU. For a small country heavily dependent on import of raw materials and with an economy that historically was closely integrated with its neighbors, the existing level of exports is abysmally low and creates a major macroeconomic risk. While traditional markets in the FSU collapsed, Armenian enterprises have faced serious difficulties with penetrating new markets. Given the standard perception of Armenians as established international traders, this indicates that transferring of trading and marketing skills from the Diaspora to Armenians in Armenia has not been successful yet. The inflow of Diasporan investments has been also much below expectations. In total during 1995-99, Armenia received on average less than $30 of FDI per capita,5 while Slovenia and Lithuania attracted more than $100 per capita, and Estonia, Hungary and the Czech Republic more than $200. And a surprisingly large part of Diasporan investments came from Russia rather than from the West, where Armenian communities have more business experience and a larger overall investment potential. • In public administration, it supported establishment of an excessive control and inspection structure, and more generally delayed deregulation of the business environment. • In policy making, it limited opportunities for public participation in discussions over reform priorities; lack of dialogue between main stockholders made it much more difficult for the Government to maintain public support for reforms and created additional problems with implementation. • In the economic area, close links between existing leading firms (both recently privatized SOEs and start-ups) and power ministries and influential politicians became a major source of noncompetitive behavior and barriers for entry. There has been little room for small and medium businesses to operate independently from political clans. • At the same time, the Armenian Government managed to establish a nice liberal façade, stop inflation, and advance various market-oriented reforms (such as privatization, liberalization, and introduction of market-friendly legislation). From the macroeconomic perspective, after 1996, the Armenian macroeconomic environment has contained few distortions associated with for instance Government regulations, nominal tax regime, and budget subsidies. Conventional indexes of reform progress suggest that by 2000, Armenia has become a leading reformer in the CIS. In addition, soon after the cease-fire was reached in 1994, the national consolidation of Armenian society started to evaporate. The political elite, which led the country’s independence movement and its war effort, was affected by serious internal conflicts and fights for leadership. Fragmentation of the political elite had its manifestation in the high turnover of Armenian Governments. Since 1991, Armenia had 10 Prime Ministers.8 While these personnel changes in most cases produced very little change in economic policy, they contributed considerably to investors’ perception of economic uncertainty and instability. • Providing strong and basically unconditional political support to the changing Armenian Governments. In all these areas the Diaspora was largely successful. Armenia became a leading global recipient of international assistance. In 2000, it received about US$240 million (11% of GDP) in total official assistance through a combination of official transfers and concessional loans, or about US$75 per capita. In addition, Armenia benefits from considerable amounts of humanitarian and technical assistance that is not reflected in the budget. In the United States, the Diaspora lobby succeeded in extracting from the Congress a disproportionally large amount of U.S. assistance to Armenia, which has amounted to $90 million a year, and at the same time blocked similar assistance programs for Azerbaijan. Armenia continues to benefit from the considerable inflow of remittances and private transfers (currently at 8-9% of GDP a year), which are mostly coming from relatives who either recently emigrated or who are temporarily working abroad. According to household surveys, not less than 15% of families were recipients of regular private transfers. And for about 8% of households such transfers represented a major element of income support in 1999. At the same time, Diaspora representatives remained disengaged from active day-to-day participation in economic and political life in Armenia. The Diaspora’s attempts to invest mostly failed due to the hostile attitude of insiders. But major Diasporan organizations have never tried in a systematic way to protect their members from business abuse in Armenia. As a strategy, the Diaspora tends to limit its public criticism out of concern for the government’s reputation. There is also no intention to do a serious evaluation of results achieved through the massive international assistance of the previous 10 years. The act of giving seems to be more important than the actual effect. This kind of Diaspora response, in my view, represents a major underutilization of the Diaspora’s potential. It does not contribute adequately to strengthening the Armenian private sector and the country’s growth prospects. Even in the cases (still limited) when the Diaspora is involved in business projects, it operates mostly a source of financing and much less as a source of market information and expertise, not a knowledge bridge. This is because the Armenia-Diaspora dialogue is still focused primarily on fostering cultural and humanitarian links. Meanwhile, there are reasons to believe that the Diaspora’s involvement in Armenia in its current form has gradually become part of the Armenian development problem, not a source of solutions for its transitional challenges. The Diaspora’s money and political support help to take the pressure out of the system and therefore they undermine demand for further domestic reforms, especially for improvements in the business environment. The ruling elite gets additional resources for survival that provide a breathing space for delaying necessary reforms despite extreme poverty and emigration of the most skilled. WHY IS IT SO DIFFICULT FOR ARMENIANS TO USE THE ISRAELI EXPERIENCE? Despite many similarities between recent Armenian history and that of Israel after its independence, there are also striking differences that could at least partially explain such a contrast in the efficiency of the Diasporas’ mobilization. First, most Diaspora Armenians have no historical connection with Armenia as currently constituted. They are Western Armenians from the region that is currently a part of Turkey. For most of them, Armenia is more of an idea than a real country that may be considered as a place of potential residency and business activity. Second, 70 years of socialism in Armenia created a cultural divide with its non-FSU Diaspora that has no parallel for Israel.10 This divide is largely responsible for the fact that the Diaspora has very limited cultural affinity with Armenia.11 Third, and the most obvious difference, is that in contrast to Israel, the Armenian Diaspora does not have an ideological foundation for supporting Armenia as there is with Zionism. It is sometimes suggested (Goldenberg, 1994, p. 146-47) that this explains why the Diaspora’s support for Armenia is less institutionalized and is less “strategic” but more individualistic and project-specific. It is also important to remember that in contrast to other Diasporas (e.g., Ukrainian and from the Baltic states), creation of an independent Armenian state was never part of the traditional agenda12 of the mainstream Diaspora in Soviet times. The opposite view was the most popular: “that Armenia could not become an independent state in face of dangers of pan-Turkism” (Suny, 1999, p. 3). As a result, the Armenian Diaspora was ideologically quite unprepared to deal with an independent Armenia. And, as it seems, after 10 years of independence it is fair to say that it failed to switch (or at least to expand) from its traditional “cultural and nationalistic” agenda to a new agenda of supporting the formation of a new independent national state. While all the issues related to the Genocide and restitution are of major historical and humanitarian significance, it is still an agenda of the past, while the nation, engaged in building its statehood from scratch, is in dire need of a positive agenda related to its future. This difference in perspective suggests that interests of the Diaspora are often different and sometimes in contradiction to those of the Armenian state (Dadwick, 1993, pp. 278-80; Amirkhanian, 1997, p. 21). For instance, the Diaspora in the United States has never tried to use its political leverage to push Turkey for opening the border with Armenia: while this is a major development issue for the Armenian state, it has never been high on the Diaspora’s list. Moreover, a very tough position of the Diaspora on the Genocide (while emotionally understandable) made inter-governmental relations between Armenia and Turkey even more difficult and dramatically reduced chances for opening the Turkish boarder for Armenian goods and services. In addition, internal political divisions in the Armenian Diaspora seem to be a surprisingly important constraint for developing a consolidated Diaspora strategy for supporting a new Armenian development agenda. These political divisions are to a major extent based on tradition and much less on real differences in current policies. The dividing line for most Diaspora Armenians is still a policy towards Turkey (Goldenberg, p. 150-51). At the initial stage of transition it may be difficult for people outside of the country to make an accurate assessment of the depth and direction of ongoing transformation. People could be biased in their desire to see more changes than actually take place. It is understandable: in the case of Cuba many exiles have been waiting for 40 years for a window of opportunity. Thus, there is a risk that the Diaspora may overestimate the actual reform effort, and over-commit its support to the first post-communist Government. This paper argues that it is important to be cautious in making an initial assessment. The scale of humanitarian needs in the home country as well as the beauty of political statements made by Government officials, are insufficient to reach a reliable conclusion. The litmus test of post-communist liberalization relates to economic liberalization and introduction of a level-playing field for established and de novo businesses. The principal lesson from the Armenian experience is that a massive program of humanitarian assistance, not complemented by an active business support and investment program, is not sustainable. It eventually fuels emigration and concentration of economic power. It does not help (but just delays) resolution of the most important challenges of transition. If the Diaspora community is not allowed to do serious business in the home country, it does not make sense to support the respective government politically and economically. If the Diaspora is wealthy and powerful so that it is capable of mobilizing considerable resources in support of the home country, it should make sure that a good portion of the resources is channeled for needs of business development and the private sector. Providing massive humanitarian assistance suggests that the Diaspora community takes serious responsibility for the current state of the home country. The same responsibility requires playing a more active role in its economic development. In other words, humanitarian assistance without investments proved to be an irresponsible strategy. • Support practical business and managerial training of new business owners and managers in new companies: they will be main business and political partners of the Diaspora. It may happen that the initial conditions of transition would be too tough for Diaspora representatives to make any rational individual investments. If this is the case, the Diaspora leaders may think about collective investment instruments to share risks, such as a seed equity fund and a Diaspora development bank. Such institutions may be rather useful to support new entry, first movers. They are also important instruments for outsiders to have first-hand knowledge of business realities and monitor patterns of economic liberalization. Finally, collective investment instruments could trigger a transformation of the inflow of humanitarian assistance into real sector investments. Another lesson to be drawn from the Armenian experience relates to the utilization of international assistance, first that of assistance provided by the U.S. Government. While the Armenian Diaspora managed to generate record amounts of U.S. assistance for Armenia, they were participating neither in designing specific assistance projects nor in general monitoring of how the money is spent. I would argue that the Diasporan organizations and Diaspora activists have to insist on playing a very active role in implementation of U.S. Government-funded projects. This may be done at the level of professional organizations of the Diaspora that would become contractors of the U.S. Agency for International Development and other similar agencies, or at individual levels, when people could go to the home country to become advisers in local NGOs, Government agencies, and restructuring firms. • Careful selection of technical assistance recipients in the public sector: avoid pushing for creation of too many and too advanced institutions (e.g., Securities Market Regulator), be more practical (e.g., building an independent Statistical Service usually is an immediate priority). Another important element of the Armenian experience relates to finding a proper balance between important issues of the past and those of the future. The Armenian Diaspora and its intellectual leaders, it seems, were and still are too preoccupied with unresolved historical issues, while less attention is given to looking at the development agenda that confronts the modern Armenian state. Cubans are likely to be exposed to a similar major risk of “demons of the past.” This is because the Diaspora’s claims in the future for restitution of assets nationalized after the revolution. Restitution is both economically and emotionally important, but its resolution can not be found over night. It will take time, during which the debates over restitution should not block Cuba’s economic life and the overall transition process. One of the objectives of this paper was to show that the Cuban-American community should be aware of a different transition path, which would make another set of questions more practical: What could be done to ease emigration pressures in early transition, especially among the young and the most skilled? How to encourage an inflow of foreign capital, technology and skills in the hostile business environment? How to transform the flow of humanitarian assistance and remittances into productive investments? How to promote business cooperation between local and Diasporan businesses? And how under these unfortunate circumstances to make the overall strategy of the Diaspora community balanced and rational? 1. The views in the paper are those of the author and should not be attributed to the World Bank. I am grateful to Yevgeny Kuznetsov and Jonathan Walters for discussions of many ideas reflected in this paper and important suggestions. 2. Rauch (1999) reviews the role of the Chinese Diaspora in facilitating international trade with mainland China. 3. Havrylyshyn and McGettigan (1999); Djankov and Murrell (2000). 4. Gould (1994) for instance presents statistical evidence of significant links between incidence of immigration to the United States and intensity of export from the country, which is a country of origin for these immigrants, to the United States. 5. In fact, even these numbers are inflated because one third of all foreign investments came through two major privatization deals in infrastructure. 6. FIAS Report (2000) provides a systematic description of the problems with the Armenian investment climate. 7. It is also relevant to note the consistency with which the concept of double citizenship has been rejected by the Armenian political elite over the last 10 years. This is another indication of local concerns about potential political competition with Diaspora l eaders. 8. Collier (2000) suggests a correlation between success of reforms and government’s tenure in power. 9. While the Armenian situation may seem extraordinary, it is unlikely to be unique. For instance, even in Lithuania, which clearly has a better investment climate, there is no noticeable inflow of the Diaspora’s investments, while the Diaspora is providing considerable humanitarian and political support. 10. Jonathan Walters suggests that in fact one could compare the Armenian Diaspora with the Jewish Diaspora in Arab countries before the mid-1950s. At that time, the Sephardim had little interest in Israel, which they considered as a European/Ashkenazi state that had little to do with their cultural or historical experience. 11. According to Goldenberg (1994, p. 135), the politics of the Cold War further reduced the significance of the Soviet Armenia a s a real or at least potential symbol of national identity. 12. Ronald Suny (1999, p. 13) suggests the following main features of traditional “Armenian cause”: pursuing the recognition of Genocide, a tougher stand toward Turkey and on the Karabakh issue, and developing closer links with and within the Diaspora. 13. Based on the experience of emigration from Puerto Rico to the United States, both intensity and direction of migration flows depend primarily on the income differentials between two countries. Thus, one should expect a significant inflow of Cuban emigrants in the early transition, not another way around. 14. See Pérez-López (2001) for the discussion of some of these issues.